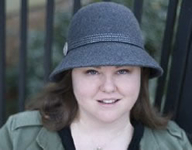 Jenn Bennett is an award-winning visual artist. She believes rebellion is an under-appreciated art form, has conjured up more demons than you’ve had hot lunches, and likes her fairy tales like she likes her coffee: dark. 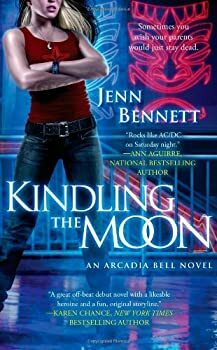 KINDLING THE MOON, the first in a new series for Pocket Books featuring the irresistible heroine Arcadia Bell, is her debut novel. She lives near Atlanta with her husband and two pugs. Learn more at Jenn Bennett’s website. Arcadia Bell — (2011-2015) Publisher: Meet Arcadia Bell: bartender, renegade magician, fugitive from the law… Being the spawn of two infamous occultists (and alleged murderers) isn’t easy, but freewheeling magician Arcadia “Cady” Bell knows how to make the best of a crummy situation. After hiding out for seven years, she’s carved an incognito niche for herself slinging drinks at the demon-friendly Tambuku Tiki Lounge. But she receives an ultimatum when unexpected surveillance footage of her notorious parents surfaces: either prove their innocence or surrender herself. Unfortunately, the only witness to the crimes was an elusive Æthyric demon, and Cady has no idea how to find it. 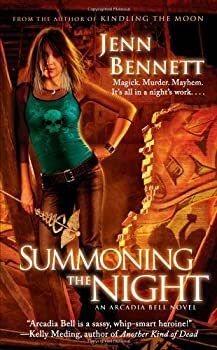 She teams up with Lon Butler, an enigmatic demonologist with a special talent for sexual spells and an arcane library of priceless stolen grimoires. Their research soon escalates into a storm of conflict involving missing police evidence, the decadent Hellfire Club, a ruthless bounty hunter, and a powerful occult society that operates way outside the law. If Cady can’t clear her family name soon, she’ll be forced to sacrifice her own life… and no amount of running will save her this time. Seven years ago, Arcadia “Cady” Bell’s occultist parents were accused of four murders. They faked their deaths and Cady’s, and the family went into hiding: the parents together, Cady separately. Now, Cady co-owns and tends bar at the Tambuku Tiki Lounge, which caters to both human and demon patrons. Then, when the media discovers her parents are still alive, the rival magical lodge Luxe demands that either they or Cady pay the price for the murders. Cady sets out to prove her parents’ innocence instead. But to do that, she’ll need to learn the identity of the one witness who knows the truth — a powerful Aethyric demon — and summon it to give an account of what really happened. CLICK HERE FOR MORE STORIES BY JENN BENNETT.